1881: John Sands, Sydney, publisher. From the collection of ESA member MA. Seems to predate this competition, maybe inspired it? 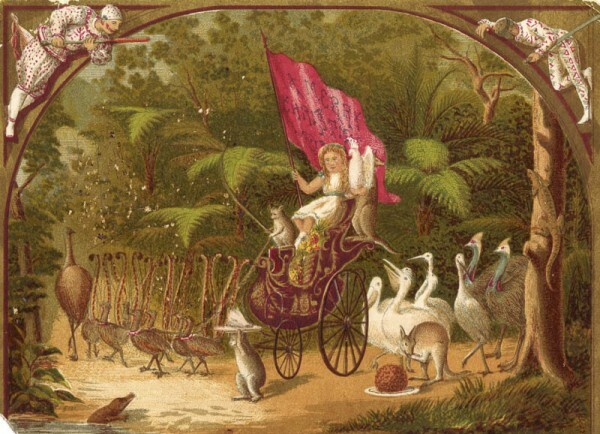 In 1881 John Sands ran a competition to find illustrations of Australian Christmas scenes. Here is a long description of the competition and some results. And the result has, so far, justified the expenditure, for of the 662 designs exhibited, while many are inartisitic and evidently the work of tyros, there are many which certainly rival the best imported work. The Minister for Education placed the Art Gallery at Mr. Sands’ disposal, and in what were the French and Belgian Courts during the International Exhibition, the designs are now arranged. On Saturday there was a Press view, and the judging was done. The first prize fell to Mrs. F. W. Stoddard Tasman House, Sydney, and was well earned. On a smooth lake floats a gondola crowded with fairies and, sprites in diaphonous robes, and the elves are so grouped that by means of their bright forms, the legend, ” A Merry Christmas,” is spelt out. Overhead float two aerial shapes whose star-pointed wands direct one’s gaze to the glory of the southern heavens- the Cross. Of course the scene is a night one, and the dusky blue tones of the picture are beautiful. Mrs. Stoddard’s design is numbered 491. The second prize is taken by Miss Emma E. Mather, Hobart, Tasmania. Her picture, numbered 183, represents a spray of flowers. The other prizes are allotted in the order in which we refer to the pictures. No. 170, 3rd prize, Mrs Fred C. Rowan, Macedon, Victoria, a pair of blue wrens and a butterfly. No. 651, 4th prize, Mrs. Edward Forde, Darlinghurst. The design shows a cluster of puce and amber berries, overhanging a little pen and ink vignette of the Prince Consort’s statue, Hyde Park. No. 502, 5th prize, Charles Turner, St. Kilda, Victoria ; a pair of cockatoos, behind whose sulphur crests a range of distant hills appears. No. 330, E. M. B. Gilbert, Hawthorne, Victoria, a somewhat hardly painted group of shells and rocks. The exhibition was visited on Saturday by Lady Augustus Loftus; and to-day, when a private view will take place, her ladyship, and several members of the Ministry, will probably be present. To-morrow, and subsequently until further notice, the exhibition will be open to the public. The arrangement of the competition has been carried out with taste and judgment by Mr. Curtis, who superintends the chromo-lithographic branch of Mr. J Sands’ business. For printing those designs Mr. Sands has imported several large chromo-litho machines, duplicates of those used by such houses as those of Delà Rue, Marcus Ward, Goodall, and Prang, and has obtained the services of a number of clever lithographic draughtsmen and printers. He is now preparing for publication a series of views of Sydney harbour and its neighbourhood, printed in facsimile of water-colour sketches specially drawn by Mr. J. C. Hoyte ; and these views will be on exhibition to-day. In addition to the 59 guineas awarded in premiums for the designs, he intends to offer 25 guineas in premiums for verses and. sonnets appropriate to them; and particulars of this competition will be advertised at an early date.